1966 Pontiac GTOs. Lot 71 of 75. CLICK-> Fontaine Blue 1966 GTO convertible, right front view with the top up. CLICK-> This Fontaine Blue 1966 GTO convertible has a Parchment interior. 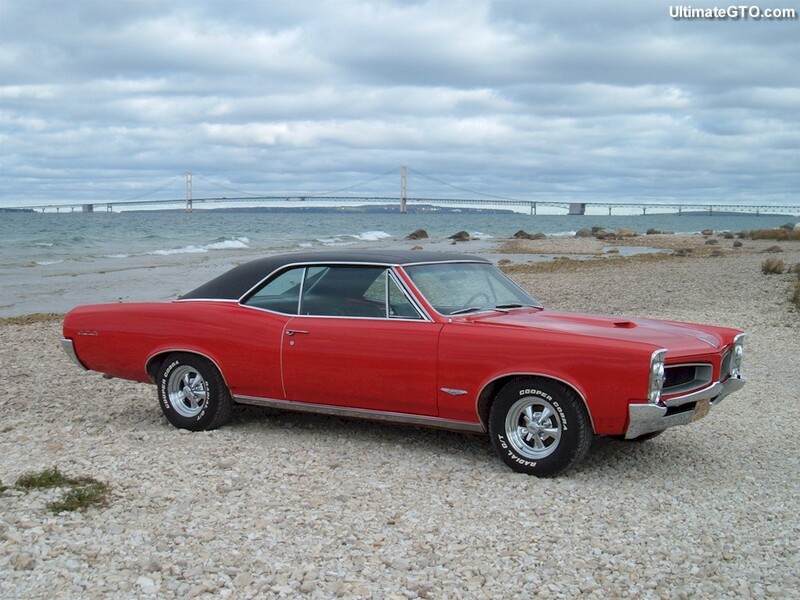 CLICK-> Charles Brecheisen owns this 1966 GTO hardtop. It is painted a very bright shade of red called Porsche Guards Red. Charles tells us more, "I knew about this car for three years before I actually went to look at it because the guy that described it said it was in need of some work. What you see is how it looked when I picked it up, with the exception of the wheels and tires! Some work! This summer, I put in a .060 over 400 that is so far passing everything but a gas station! I plan on modifying the hood for true ram air either late this year or early next. Everything is super clean on this car and she rides and drives great!" CLICK-> Red 1966 GTO hardtop with a huge bridge in the background. This shot would look great as your desktop wallpaper; 800-600 wallpaper and 1024-768 wallpaper. CLICK-> Red 1966 GTO hardtop, another left side view. CLICK-> This is Milt Schornack's Tiger Gold 1966 GTO hardtop. This is a better-than-original replica of The Royal Race Team's 1966 Royal Bobcat GTO. We have more pictures of it from the 2006 GTOAA Nationals in Louisville, Kentucky. Click here to see them using the Advanced Picture Searcher loaded with owner=Milt Schornack and show=2006-GTOAA. CLICK-> Ed White drew this awesome red 1966 GTO convertible. This was our Picture Of The Week for 2/18/07. Ed explains, "This is my all-time favorite 'dream car'. It's red, low, has big wheels on it and I customized the interior a bit by coupling the white interior with red carpet and dash pad instead of the black. I had a '66 convertible 'project car' body and chassis that I let slip away to pay off a debt some time ago but I swore if I got ahold of another one this is what it will be. Running gear is a fuel injected 389, 6-spd, posi. The fuel injection would be a custom set of three-two barrel throttle bodies (that come on sequentially per the original design) atop of a modified aluminum manifold." Click here to see other drawings from Ed White using the Advanced Picture Searcher loaded with condition=artwork and owner=Ed White. CLICK-> Joe Sparks is waking his sleeping Goats from winter hibernation. This was our Springtime Picture Of The Week for 4/8/07. Joe owns a black 1966 GTO hardtop and a black 1973 GTO. Click here to see more of Joe's GTOs with the help of the Advanced Picture Searcher loaded with owner=Joe Sparks. CLICK-> Red 1966 LeMans convertible owned by Rafi from Melbourne, Florida. This was our Picture Of The Week for 6/3/07. Rafi comments, "I got in 2005 on eBay. I completely rebuilt the rear suspension, Hotchkis springs and sway bars all around, with 18x8 rims 235/40/18 Redlines in front and 20x9 285/35/20 BF Goodrich Redlines in back. I will add front disc power brakes, drilled and slotted. I am very interested in the opinion of what true GTO people think of my car so far?" CLICK-> Red 1966 LeMans convertible, right side view. He picked a very good background for the car's photo. Many times people snap photos of their car with a dumpster and trash cans all around. CLICK-> Another right front view of Rafi's red 1966 LeMans convertible. I'm digging the look of the wheels, especially in the rear. I do like how the Pontiac's cavernous wheelwells are filled up by these wheels and tires. CLICK-> Another right side view of Rafi's red 1966 LeMans convertible. This time it is on his yard and on a sunny day. CLICK-> Looking up the left side of this red 1966 LeMans convertible. Those are real redline tires. CLICK-> A peek under the car. CLICK-> I snapped this shot of a burgundy 1966 GTO hardtop at a Moose Lodge car show in Gas City, Indiana. I don't know who owns this car, but I have seen it at some other local shows too. This was our Picture Of The Week for 7-15-07. I won't soon forget this car show day. It was a beautiful Saturday in July. Being a Moose lodge, they had planned a few patriotic festivities for the car show participants. The Boy Scouts stopped by to present the colors. Everyone stopped to look at the flag while a lady sang the national anthem live. She did a beautiful job. Later in the afternoon, another unexpected patriotic thing happened. The DJ suddenly stopped all the oldies music. He drew everyone's attention to the main state road next to the car show. A funeral procession was about to pass by. He said it was a 42-year old veteran that had lost his life. The DJ asked everyone at the car show to go stand by the side of the road as the funeral procession passed by. I can say I was one of the couple hundred people that was choked up to see such a sight. The car show crowd was lined up all along the roadway, watching the long procession of motorcycles with USA flags, police cars, the hearse, and then many other cars, obviously friends and family of the veteran. We could see that the participants in the procession were visually moved by our show of respect for a young military man who had died. Some waves, thumbs-up, and nods were exchanged. That was a serious and emotionally intense 15 minutes or so. The thing that I will remember is when I returned to the car, the DJ started playing the goofy old oldies music again. I thought how lucky we are to have this car show hobby in this country. Other guys lose their lives so I can enjoy my freedoms. For that, I am now more appreciative.